Greetings from the craft desk this weekend. I'm still enjoying being able to actually work on my newly sorta clean desk. Hoping to get the rest of the room looking a bit less like an episode of hoarders over the school holidays. Wish me luck!! 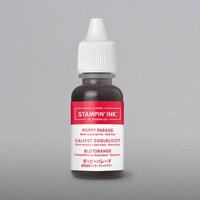 Pop that on when you're ordering online and I'll pop some samples in the post for you next month. October class dates are here now if you're keen to catch a class next month. We'll be doing Faux Linen technique. 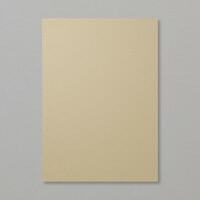 (So I need to take a trip to Bunnings for some fine sandpaper.) Plus we'll be making some other cards including some Christmas cards. Class fee is $25. 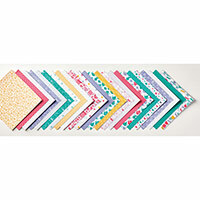 Everything is supplied and classes are suitable for beginners and enjoyable for experienced card makers. Classes are held at my place in Avondale Heights. Phone/text 0417 377 057 or email smadex@bigpond.com to grab your spot at the table. Don't forget to pop the date in your diary. 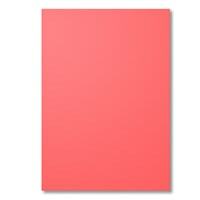 We'd love to make you welcome at card class. I have the loveliest group of class regulars. Come and join us. I've added a few extra bells and whistles to my video set up. Catch my latest video here where I give them all a test run. (Still figuring out how to drive them all - wink.) I've got some foil edge cards to share plus we'll have a closer look at the Timeless Tidings Christmas Card Kit. I'll be back live tomorrow over on facebook at SueMadexPapercrafts. Hopefully at my usual 11am time but we've got a couple of tradies coming to do some jobs in the kitchen tomorrow so I might need to be a bit flexible with the timing I think. We had such a lot of fun with this beautiful watercolouring on craft ink technique at classes in July/early Aug. It looks lovely and artistic and is very easy to do with just a few bits and pieces. 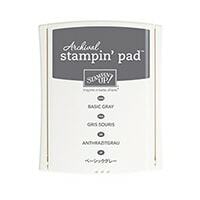 Stamp your outline image in white craft ink and emboss with white embossing powder. 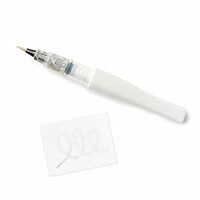 Squirt a drop or two of white craft ink onto a lid or palette and use a damp aquapainter to pick up some ink. Use the craft ink to colour your image. It soaks in a little so you may want to do a layer or two. Leave to dry thoroughly, or use a heat gun to speed this up a bit. Now comes the fun bit. Choose your colours and pop a drop or two of your classic ink reinker/s onto your lid. 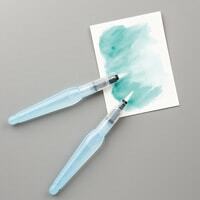 Pick up a little ink with your aquapainter. I like to do a brush stroke or two onto scrap paper first or a tiny blot on paper towel or I seem to get too much ink on that first dab. Colour in your image. 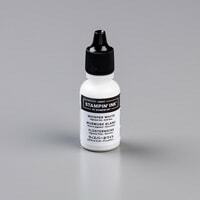 It blends beautifully over your base layer of white. You'll find you'll naturally get more and less ink in places which looks really effective and effortlessly artistic I think! Leave to dry or use that heat gun again. The colour fades a little once dry. You end up with a lovely soft looking image. Love this one too with the flowers left white this time with Daffodil Delights centres and a pale wash of Pear Pizzazz for the leaves. Those speckles are the sparkles - hard to photograph. Class regular Brenda loves purple. I gave her combo a whirl too - Highland Heather with a touch of Navy for the centres. What's your favourite colour combination? 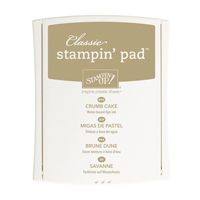 This is a great technique to try on Crumb Cake cardstock with any of your favourite outline style stamps. Shopping from home? Here's the shopping links if you need them. Care for a cuppa? 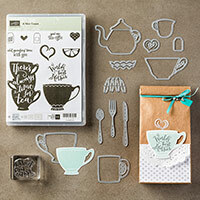 The Cup and Kettle Framelits and coordinating 'A Nice Cuppa' stamp set are just the products for making a comforting card for someone. Tips and Techniques: This was one of our class cards last month. We used the 'Have A Cuppa' Designer Series stack and the cards looked quite different depending on which patterned paper people chose. Grab the designer paper stack and the coordinating cardstock pack and you can't go wrong. We used a range of circles from the circles framelits too - a handy pack to have. They layer well with our doilies. Some washi tape for a little extra oomph. The heart shaped steam is rather snazzy. It looks good cut from the Dazzling Diamonds Glimmer Paper too. 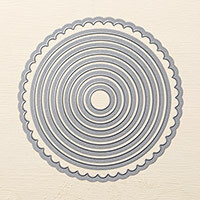 I love this card from Rachel Palmieri where she sponged the tea pot for some added dimension - must try that next time. Would you like to catch a card class in April? All this talk of tea pots has put me in the mood for a nice cup of tea. Off to boil the kettle. 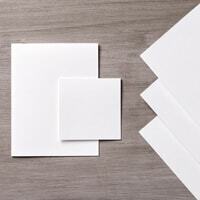 Are you keen to get stuck into some card making? Like to make some cards and have a little me-time? February is here which means it is time to start new classes for 2016. Classes are held at my house in Avondale Heights, in Melbourne's west. We'll be using some of the gorgeous new stamps and tools in the Occasions and Saleabration range to make 3 cards with coordinating envelopes. Learn some stamping techniques, try out some new craft items and have fun with a table of craft loving ladies. A great way to get some creative time into your 2016. Class fee is $25. All materials supplied. There are 5 dates to choose from this month. Phone or email to grab a place in the date that suits you. I hold classes at my house in Avondale Heights, Melbourne. Classes are held at my dining table. Friendly and fun - all welcome. HOW DO I FIND OUT DATES? HOW MANY PEOPLE AT A CLASS? There's a maximum of 8 people per class and dates do book out, so it is a good idea to book early. If a class you're interested in is booked out, please ask to go on the waiting list in case of cancellations. Classes are suitable for beginners and experienced stampers and card makers. I aim to keep things friendly, fun and relaxed. Just bring yourself and your class fee. All tools and materials are supplied. Class fee is $25 (unless otherwise specified.) Payable at the class. If you cannot make a class you've booked for, please let me know as soon as possible so that someone else can possibly take your place at the table. ** Note: With after school activities for the kids we're often squeezing in dinner just before class. Please aim to arrive around 7.25pm for evening classes as before that we'll be running around like headless chooks getting home and organised. Much appreciated! Hope to see you at a class. 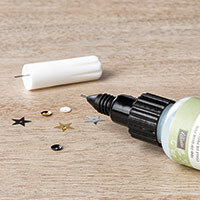 It is a great way to try some new products and techniques, meet some friendly crafters and build up a stash of cards. 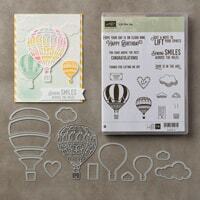 Just popping in quickly to update you with a few little snippets of Stampin' Up news. February Classes start this week. Spaces left for most dates. 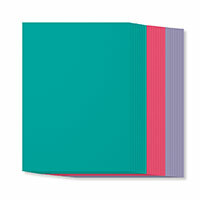 We'll be making 3 cards at this class featuring new products from the Occasions and Saleabration range. 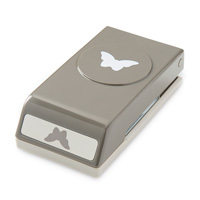 Try out the butterfly thinlit, the bow punch and more. Phone or email to book your spot, then don't forget to pop it in your diary, on your calendar or in your phone. Classes are held at my place in Avondale Heights, in Melbourne's west. The latest edition of my Madex Creations newsletter has just zoomed on its way to inboxes. If you'd like to join the fun, there's a sign up box at the top right here. Just fill in your email address and click GO. If you are ordering by phone or email, just let me know what you'd like to pick. 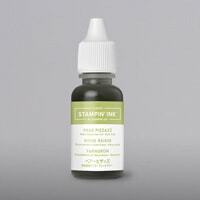 One free Saleabration product for every $90 of goodies you order. If you are placing an order online, here's how to select your free saleabration products. Once you've put $90 of products into your shopping bag, you'll see this appear down the bottom of the screen. "Congratulations: You qualify for one or more free saleabration products, Click Here." When you click, you'll see a pop up menu appear and you can select your chosen freebies. My personal favourite is this gorgeous Irresistibly Yours DSP. 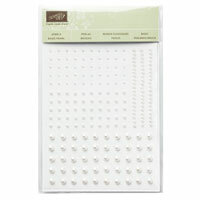 White with white embossed patterns - you just add your ink by sponging, spritzing or brayering. 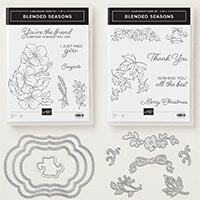 Another one I'm loving is the Lotus Blossom stamp. A triple layer stamp - beautiful. Or you can start your collection of Blendabilities alcohol markers, or add to them. Choose a pack of Blendabilities as your Saleabration freebie. They come in packs of 3 - you get a light, medium and dark of your chosen colour. That's about it for news from Stampin' Up in Australia today. I hope you are having a lovely Sunday. We've been focused on getting back into school and work routines, getting settled in to Year 7 homework and all that the last few weeks. I hope to be back sharing some creations of my own with you very soon. Want to catch a card class? Here's my upcoming class dates and details. Classes are held at my house in Avondale Heights, Melbourne. We'll be using Stampin' Up's new alcohol makers Blendabilities to make 2 cards, plus you'll get to stamp a few more pieces using a range of my colouring friendly stamps to take home. We'll also be taking a break from the markers to make a beautiful peacock card using a blender pen and white craft ink to add highlights. 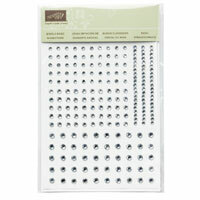 ........ includes a pack of Cherry Cobbler Blendabilities Markers for you to use at class and take home afterwards. Pack of 3 - light, medium and dark Cherry Cobbler. Get in touch if you need bank details for direct deposit. Phone or email to book your spot if you'd like to make these 3 cards and take home a pack of Cherry Cobbler Blendabilities. We'll be making 3 Christmas cards using some new products from our upcoming Holiday Catalogue. Get into the festive spirit with some Christmas creating. Class Fee: $20. All materials supplied. 5 dates to choose from and filling up very very fast. Christmas classes are always popular. Get in touch if you'd like to book a spot. This was one of those class cards that looked quite different depending on which DSP (patterned paper) and colours people selected. Here's another of my variations. I love the Sweet Sorbet DSP. Lovely soft colours. Some ribbon and tags to finish this one. 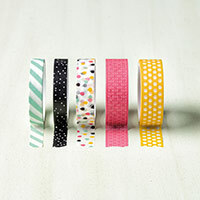 I love the Retro Fresh washi tape too. Hope your weekend is relaxing. Any craft time for you this weekend?